If he’d been born a century ago, Ken Oldham would have been a sure as shootin’ a circuit-riding minister. For you whippersnappers, that means he would have ridden a horse from one rural or frontier church to the next, perhaps preaching at four churches over the course of four Sundays and then repeating the process each month. Oldham, 50, who’s been a country music singer and limousine driver, has a full-time job but moonlights as a saddle maker and Baptist preacher. Horses, music and the gospel have shaped his life since childhood. “I’m too blessed to be distressed,” says the Nashville native, a graduate of Smyrna High School, who will preach cowboy church services at Tennessee Miller Coliseum on April 22 during Professional Auction Services Southeast Winter Cutting Sale. For the past two years, he has held cowboy church one Sunday a month, April through November, for the Music City Cutting Horse Association at the Wilson County Fairgrounds in Lebanon. Says Frank Casey, show secretary for the upcoming winter cutting sale and member of the cutting horse association, “This sport is like no other sport I have been involved in. The same person you’re competing with in that class will be same person helping you turn back cattle. Everybody helps each other, no matter what they score. It is a competition, but their sportsmanlike conduct is amazing. “Ken understands horses and cattle, and what it is like to be on the road and loving being there but not being able to go to conventional church services. So he allows us to have a church service. If not for preachers like Ken, willing to give their time, we would not be able to worship. “His preaching is straightforward and from the hip. I believe the Lord has his hand on him, and he has blessed us in so many ways,” said Casey. “I was called to preach when I was 18 years old,” recollects Oldham. “I preached for 1 years in a mission in Smyrna. Then the music business called and I left that. I began again in 1998 holding revival meetings, preaching by appointment and at weekend youth revivals. The evangelist has never pastored a church but has preached in 10 states and Jamaica. These days he averages 10 to 12 appointments a year. As for his days as a professional musician, he sang high tenor with his brothers Billy, Mike and John in the country music group The Oldham Brothers, which performed across the Southeast from 1984 to 1990. “I was in the music industry for about all my life. Me and my brothers started singing four-part gospel harmony as soon as we could talk. My dad was a Baptist preacher. We’d sing and he’d preach,” said Oldham. The other love for this man with a gospel bent is horses. He got his first horse when he was 5 or 6 and has trained horses off and on for 20 years. He and his wife Lin, who have lived in Christiana for 8 years, have two sons and two horses. He worked in HVAC for 15 years, and by providence turned his hand toward saddle making after a bad accident. “I wrecked a van in Franklin in 1995 and messed up my back. The doctor said I couldn’t work in HVAC (heating, venting and air conditioning) business. My back wouldn’t hold up. The state said they would educate me in another occupation,” said Oldham. From August to December of 2002, Oldham crammed six months of study into four learning from master saddle maker Davis, studying eight to 12 hours a day. Oldham opened his saddle and leather repair business in 2003. 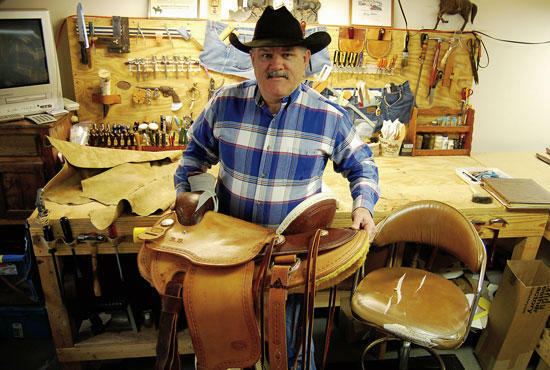 He has built a dozen saddles and also makes gun holsters, bar stool covers, saddle accessories such as breast collars, flanks, straps and head stocks, hand-tied rope halters, and leather Bible covers. What he enjoys most about the process is “seeing the raw material cut and coming together. The raw material comes in a great big sheet (a 23X25 foot square). Everything I do is hand done but for one or two items,” he says. His numerous tools used in leather craft include round knife, edgers, compass, saddle hammer, swivel knife, strap cutter, splitter and clicker. Oldham’s saddles start at $1,800, and he can craft such varieties as cutting, association, ranch roping, team roping and barrel saddles. “Each has its own little twist. They look a lot alike but have a couple of different features,” he says. It he were working at it full time, he could make a saddle in two weeks but now that he is branch manager of the Nashville region for PTI, a company that transports railroad workers for CSX and NS (Norfolk Southern), it takes him from two to three months to complete a saddle. Rutherford County saddle maker Ken Oldham works out of his leather shop in Christiana. For more info, contact Oldham at 615-306-1544 or via email at kenolin2@att.net. Also a preacher, he will hold cowboy church services at 8 a.m. Sunday, April 22, at Tennessee Miller Coliseum during Professional Auction Services Southeast Winter Cutting Sale. The sale runs April 20-22 and features cutting shows April 20 and 22 and an auction April 21. The event, free and open to the public, is based on cutting horses, which are trained to cut or pull a cow from the herd.